Running a successful online business isn’t easy. And what makes it even more difficult is when merchants are bogged down with their order fulfillment. Often times this aspect of an eCommerce business is viewed as a necessity, something that sellers can get away with doing themselves as long as their efforts are satisfactory. The truth is, order fulfillment should be viewed as a competitive advantage, one that either directly gives you a leg up through cost savings, speed and/or reliability, or one that indirectly provides a competitive edge by freeing up time and resources to focus on other parts of your business. For online merchants that are currently handling their own order fulfillment, here are 5 signs that it may be time to consider outsourcing. As any online seller knows, you can’t just put up a website and start raking in the sales. In order to grow your business, you need to source great products, effectively advertise those products, and differentiate your brand within the marketplace. The world of eCommerce is growing fast, and standing out among the competition is getting harder to do. If you’re devoting a lot of time to picking, packing and shipping your merchandise, it may be at the expense of building an effective presence and perception of your brand, which means it may be time to let others handle your order fulfillment. Many online sellers experience seasonal sales spikes and lulls throughout the year, and as these occur, certain costs, such as warehouse rent and labor, often remain fixed. One of the biggest benefits to outsourcing your order fulfillment is that, by doing so, you’re able to transform these types of fixed costs into a variable model that allows you to maintain a more constant and predictable cost per order. If you’re tired of worrying about how you’re going to pay the utility companies because you had to keep the lights and air conditioning on all summer even though you didn’t have many orders, then outsourced order fulfillment may be a great alternative for you. 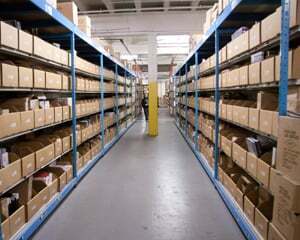 Take a look around your warehouse. Is it big enough to house all of your inventory as your business grows? How about your staff? Will they be able to handle the growth, or will you need to hire a bigger warehouse crew. These are things you shouldn’t have to worry about. When you outsource your order fulfillment, you can rest easy knowing that your operations will effortlessly scale with your business as it grows, whether that growth is fast-paced, or more gradual. Technology isn’t cheap, nor is maintaining it. Many online sellers find that, when they keep their fulfillment in-house, a huge chunk of their total annual budget gets devoted to constantly maintaining and upgrading technology and warehouse equipment. By outsourcing your fulfillment, you pass that buck to your provider, which is typically much more cost effective as the fulfillment company’s technology costs are spread across many clients. Many merchants also discover that order fulfillment is rather complex. They often find themselves asking questions like, what’s the best method for delivering this type of package to this location? How many orders should my staff be able to process in an hour? What is considered a good accuracy rate, and how do I eliminate errors? Before sellers outsource their order fulfillment, they often need to first admit to themselves that they simply don’t know what they don’t know, and that fulfillment is not one of their core competencies. Well this one’s easy….everybody wants to cut costs, right? With outsourced order fulfillment, not only can sellers more accurately predict expenses by eliminating fixed costs, they can also take advantage of shipping discounts offered by fulfillment companies, discounts that many sellers could not have otherwise gained on their own. While some merchants do have products and orders that require high labor and customization, and therefore, for those sellers, in-house fulfillment makes more sense, many merchants will find that outsourced fulfillment is a better, cost-effective option. Consumer expectations are high, and they’re getting higher. Competition is fierce, and it’s getting fiercer. In this day and age, you can’t afford for your order fulfillment to just be satisfactory….it needs to be extraordinary. If you’re in need of an established, proven, reliable fulfillment partner, let us know, we’d love to talk. Is your in-house order fulfillment keeping your business from reaching the next level? Here are 5 signs that it may be time to outsource it.